What’s the cutest and cuddliest holiday of the year? No, not Valentine’s Day! Puppy parents everywhere celebrate National Puppy Day on March 23rd. What an extra-special way for you to enjoy your puppy (or adult dog) than a national holiday just for THEM? This Cutler Bay pet sitter has 4 fun ideas about National Puppy Day just for you! 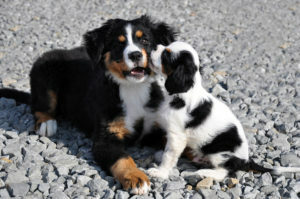 March 23rd has been recognized as National Puppy Day and was founded in 2006 by author Colleen Paige. The holiday is set aside to focus attention on puppies in need of adoption, and on the abuses found in puppy mills. It is also a fun time to celebrate your dog! National Puppy Day is a just fun day to spend time with your dog. Go for a walk with a new leash, have extra snuggles on the couch, give your pup a yummy treat she loves. Take some time to enjoy the day at a dog-friendly café or shop. Whatever your dog likes to do, celebrate that on March 23rd. Dogs love to be pampered! Buy some of your pup’s favorite-smelling dog shampoo and give him a nice bath and brushing. If you want to splurge for a groomer, your dog would appreciate that and smell terrific. 2. Buy your dog a new leash, collar, and tag. And if you don’t already have him microchipped, you can do that this week as well. There are a ton of cute leash/collar/tag combos out there, like this flamingo-print one from ETSY. 3. Puppies love a cuddly bed, and depending on how fast your pup is growing, he may need a new bed this month. Find a soft but supportive bed and your dog will surely love sleeping on it (instead of your bed)! If your puppy likes to sleep in your room, make sure he has a crate to sleep in and that his bed will fit in the crate. This way, you can crate train him and he can sleep near you at night. 4. Buy your puppy some natural treats and/or organic dog food. You can even make dog food and treats at home. Make sure any treats or food you make is dog-friendly (the ingredients are totally OK for dogs). How are you celebrating National Puppy Day? Do you have anything special planned for you and your pup? Contact us HERE for more info on puppy sitting, dog sitting, and dog walking!